Compost is the backbone of our soil fertility program. We are proud to make our own compost on site and turn “waste materials” into rich compost filled with microbial life. We utilize all that we can from our farm to produce compost including prunings from our 30,000 trees, fruit that is too damaged to go to our customers or to our Farm Kitchen, decommissioned CSA boxes, coffee grinds from our Ferry Building Café, and produce that we rescue from wholesale markets that would otherwise be bound for a landfill. All these materials add up to about 3,000 tons of compost a year that we feed our trees. We are also host to a burgeoning community of red wriggler worms. With millions of worms in residence, we are producing 33 tons of vermicompost a year to enhance and diversify the microbial life on our farm. 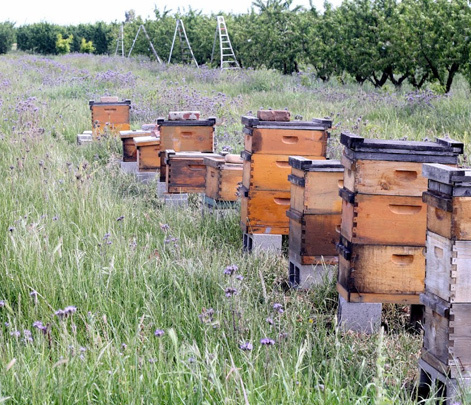 In conjunction with the UC Berkeley Urban Bee Lab we maintain 13 acres of habitat plantings on our farm. These plantings serve as habitat for beneficial insects, birds, and other wildlife, as well as encourage the population of CA Native Bees on our farm. Colony Collapse Disorder (CCD) of European honeybees, the primary pollinator of agricultural crops, is of serious concern. Providing habitat to encourage and protect a diversity pollinators is an important strategy for agricultural sustainability and resilience. We provide nesting sites for owls, bats, and native bees throughout our Orchard who help us control pest populations and encourage our beneficial Native Bee populations. Click to read more about our owls, bats, and bees..